While bicycling is a big recreational sport in Southwestern Pennsylvania with miles and miles of groomed rails to trails surfaces, riders with The Fuller Center for Housing weren’t thinking of the exercise when they peddled into Connellsville this week. 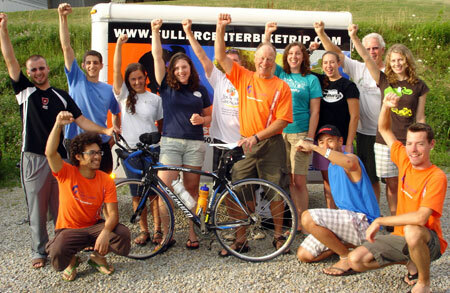 Biking 2,500 miles from Niagara Falls to New Orleans in just 50 days, participants in the Fuller Center Bike Adventure are hoping to raise $250,000 for the Fuller Center for Housing, which was founded by Habitat for Humanity founder Millard Fuller in 2005. The Fuller Center for Housing began its work building and repairing houses for low-income families in Louisiana after Hurricane Katrina. Today, the Fuller Center works in 70 cities throughout the United States and 16 countries and has built or repaired more than 650 houses for low-income families. Ryan Iafigliola started the Fuller Center Bike Adventure just three years ago as a way to raise money for the Fuller Center and has seen at least 200 riders join them on their rides over that time, he said. The group travels 70 miles a day on bikes, stopping at various churches and service organizations along the way to tell individuals about The Fuller Center for Housing, its mission and what members are hoping to raise. "We tell them about our trip, how we’re sleeping on floors and in a new place every day and we challenge them to get involved," Iafigliola said. "Besides raising money for our particular trip, we also challenge them with the five loaves and two fishes where we’re trying to get 500 churches around the country to commit to fixing up two homes in their area." When they pulled into the Connellsville Church of God off Breakneck Road earlier this week, they had raised $44,000. "We’re nearing the quarter-point of our trip, so we’re hoping to have raised $63,000 by the end of this week," Iafigliola said. The group got connected with the church after reviewing a map of the trip and searching the Internet. "They were looking for a placed to stay and found us on the Internet," Pastor Nelson Confer said. "They saw we had a gym where they could sleep and they needed a place to shower." While the church didn’t have showers, Confer said they partnered with Connellsville Community Ministries in town to provide that amenity. "We were thrilled to have them here," he said. "After I read about their ministry, I was impressed with what they’re doing. They’re riding a long way to raise money to build homes for those in need." Iafigliola said they also will be helping to fix up homes at six stops along the way: Aurora, Ohio, Washington, Virginia Beach, Va., Americus, Ga., and Spartanburg, S.C.